If you’ve ever used a chainsaw with a chain that’s been sharpened by a grinder, you know just how good it feels. It chews easily through the thickest and greenest hardwoods. Towering mammoths can be felled with greater precision. But do you know how to sharpen a chainsaw chain with a grinder? A properly sharpened chainsaw is a remarkably satisfying and reliable tool. Learn how to sharpen chainsaw with electric chainsaw sharpener in 5 easy steps. There are quite a few chainsaw sharpeners to choose from. The one you should choose depends on how often you typically use your chainsaw. If your chainsaw use is infrequent – less than once or twice a month – we recommend a more economical model, such as the Buffalo Tools ECSS Electric Chainsaw Sharpener. For those who will be using a chainsaw very frequently, we suggest investing in a bench grinder. The Oregon 511AX Saw Chain Bench Grinder and the Timber Tuff CS-BWM Benchtop Electric Chain Saw Chain Sharpener are both excellent models. Once you’ve chosen and purchased the proper sharpener, you’re ready to learn how to sharpen chainsaw with electric chainsaw sharpener. This is one of the most important steps, so make sure you proceed carefully. Use the manual for your particular electric sharpener and assemble every component in the proper order. Make sure to use the proper sharpening pitch and grinding wheel thickness for your chain. Refer to your chainsaw’s manual and your chainsaw chain’s packaging for this information. Using the included wheel edge template as a guide, contour the edge of the wheel as needed. While the sharpener is running, gently press the wheel-dressing brick against the two outside edges of the wheel to round them. The wheel is ready once it fits perfectly in the template. Next, double-check that the angles you’ve set are correct. Mount the chain on the sharpener. Bring the wheel down and advance the chain stop adjustment forward until the chain is just making light contact with the wheel. Rotate the chain mount to the appropriate angle for cutting the right-hand side plates, also known as cutters. Lock the chain in place and turn on the sharpener. Using a gentle touch, sharpen each of the right-hand cutters. Once you’ve sharpened each right-hand side plate, rotate the chain mount to the corresponding angle for the left-hand side plates. Sharpen each left-hand cutter. Use your template to check that the distance between each cutter is the same across the entire chain. Remove the grinding wheel that was used for sharpening the cutters and replace it with the depth gauge wheel. It’s very important that you refer to the included template for this shape, as a properly shaped depth gauge will make the chainsaw’s job a lot smoother. Dress the wheel by gently carving the outside edge into a rounded, concave shape. You can think of this as the opposite of the dressing you did in step 3. Set the wheel head to 90 degrees and the chain mount to 0 degrees. Using a flat file and a depth gauge tool, file a single depth gauge down to the proper level. You can then use this depth gauge to set the chain stop and the wheel depth to the proper level. You should position the depth gauge directly under the cutting wheel when setting the cutting wheel depth. Again with a gentle touch, sharpen each of the chain’s depth gauges. Periodically use the template to ensure your electric chainsaw grinder’s settings are correct. Once you’ve sharpened each depth gauge, you’re ready to saw. – You know your chain is dull if the resulting cut is ragged and the chainsaw shoots hot dust. 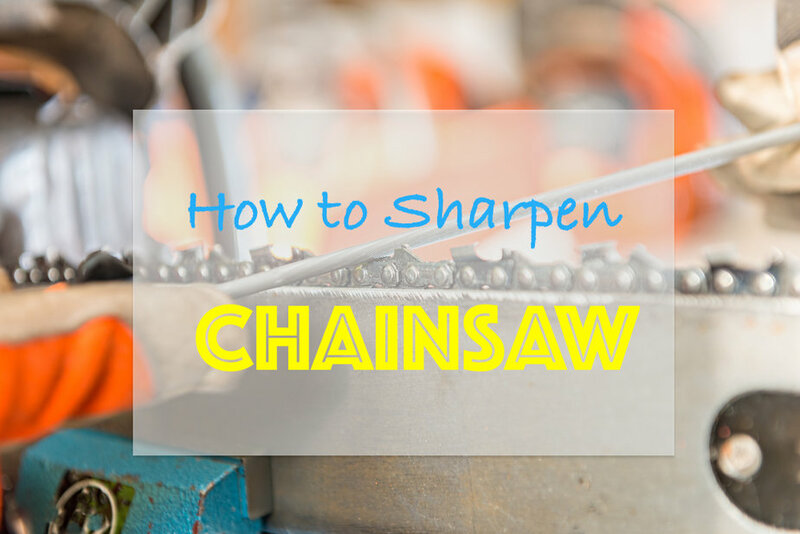 A sharp chain will produce a smooth cut and big, mulch-like chunks of sawdust. – As you’re sharpening the chain, you should occasionally stop to measure your work with a template or ruler. It’s much easier to correct a depth mistake if you catch it early than it is after you’ve sharpened your entire chain. – While an electric chain sharpener is an irreplaceable addition to your shop setup, it’s not something you can take into the field with you. If you can’t get back to your shop while using your chainsaw, maintain the chain’s sharpness with a chainsaw file each time you fill up the gas tank. – Never skip sharpening your chain! If your chain is dull, cutting with your chainsaw will be more dangerous and less effective. – Stock up on lots of grinding wheels, as they can wear down quickly. – Even if you feel confident that you know how to sharpen chainsaw with electric chainsaw sharpener, read the manual completely and always wear the appropriate safety gear. Safety glasses and earplugs are highly recommended. These 5 simple steps can be used with virtually any benchtop electric chainsaw grinder. By following them, you’ll be able to sharpen your chainsaw chain safely, effectively and quickly. Learning how to sharpen a chainsaw chain with a grinder is itself a rewarding and valuable part of owning a chainsaw. Once you’ve tried it, you’ll never want to let the shop sharpen it again!